Soltan Attar, S., Monshi, A., Meratian, M. (2011). The influence of TiO2 and Na2CO3 on the viscosity and crystallization behavior of mold powders. International Journal of Iron & Steel Society of Iran, 8(1), 5-11. S. Soltan Attar; A. Monshi; M. Meratian. "The influence of TiO2 and Na2CO3 on the viscosity and crystallization behavior of mold powders". 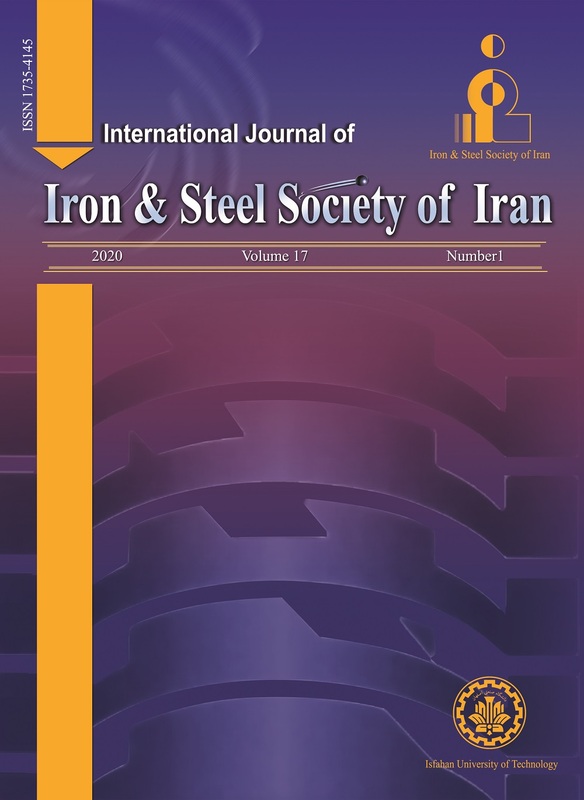 International Journal of Iron & Steel Society of Iran, 8, 1, 2011, 5-11. Soltan Attar, S., Monshi, A., Meratian, M. (2011). 'The influence of TiO2 and Na2CO3 on the viscosity and crystallization behavior of mold powders', International Journal of Iron & Steel Society of Iran, 8(1), pp. 5-11. Soltan Attar, S., Monshi, A., Meratian, M. The influence of TiO2 and Na2CO3 on the viscosity and crystallization behavior of mold powders. International Journal of Iron & Steel Society of Iran, 2011; 8(1): 5-11. Department of Materials Engineering, Isfahan University of Technology, 8415683111, Isfahan, Iran. Mold powders are fluxing agents used as raw materials in the steel industry, which play very important role in processing stability and final surface quality of a product. Surface quality depends particularly on the viscosity and the heat transfer of infiltrated mold flux between the mold wall and the solidified steel shell. Heat flux across the interfacial gap depends on thermal properties of slag layer and its thickness, which is affected by slag properties such as melting, crystallization behavior, and temperature-dependent viscosity. Among all of the components of these powders, fluorine mainly controls the viscosity, solidification temperature and crystallization behavior of mold flux films. However, the volatilization and acidification of the fluoride is a significant health hazard and causes environmental pollution and intensifies the erosion to continuous caster. In this study, TiO2 is used as a substitution to fluorine in commercial start flux. The substitution possibility was examined by measuring the viscosity and crystallization behavior, when it was compared with the properties of industrial powder. In present study, devitrification has been investigated by DTA non-isothermal experiments. It has been shown that titanium dioxide tends to increase crystallization temperature with increasing the formation of perovskite crystalline phase and this causes a decrease in heat flux between the strand and the copper mold. On the other hand, slag viscosity was decreased with increasing titanium dioxide and Na2CO3 content. Further XRD characterizations have provided a similar fraction of crystalline phases through Riaz method in the industrial powder and low fluorine sample with 8wt% TiO2. R.W. Soares, M.V.A. Fonseca, R. Neuman, V.J. Menezes, A.O. Lavinas and J. Dweck: Thermochim. Y. Meng and B.G. Thomas: Metall. Mater. Trans. J.Gisby: ISIJ Int., 45(2005), 1051. T. Cimarelli: Metall. Ital. Italy, 89(1997), 31. K.C. Mills, S. Sridhar, A.S. Normanton and S.T. J. Cho, H. Shibata, T. Emi and M. Suzuki: ISIJ Int. K.W. Yi, Y.T. Kim and D.Y. Kim, Met. Mater. Int. Metallurgical Quarterly, Netherlands, 38(1999), 363. Institute of Mining and Metallurgy, (2004), 821.
and Salts, Stockholm Helsinki, (2000). K.C. Mills, L. Courtney, A.B. Fox, B. Harris, Z.